Now that the sun is shining, you can get a glimpse of just how much dirt and grime has piled up during winter hibernation. Spring cleaning season is officially here. Before you start dusting, it’s important to make the most of your time. We spoke to home organizing experts and broke down the process of spring cleaning room-by-room to keep it simple. Before you begin, gather the supplies you need so you don’t have to stop in the middle of your cleaning spree to grab something. Pro Tip: Place all your supplies in an empty laundry basket that can be easily transported from room to room. Spring cleaning and properly organizing your kitchen requires going the extra mile. It’s time pull on your gloves, throw open the refrigerator doors and get to work. "Empty out cabinets each spring to declutter and let go of items that are broken or no longer functional. As you empty a cabinet, determine how many items do the same job and decide how many you need of each." The pantry and fridge are the most important areas to focus on during spring cleaning. Delap recommends that the pantry should be organized each season, since the types of foods you eat change as temperatures rise and fall. Take a spring cleaning tip from the grocery store, and group similar items together so you can easily see everything. “As you add a new appliance or cooking item, let go of the old one by donating it” she explains. Make it a habit to dispose of old appliances as you acquire new items. This will make spring cleaning next year more efficient—and help families in need set up their own homes. □ Wash any dishes in the sink and put them away. □ Dust any light fixtures or fans carefully. □ Dust all cabinet tops. □ Clear out the cabinets and wipe out any built-up dirt or grime. 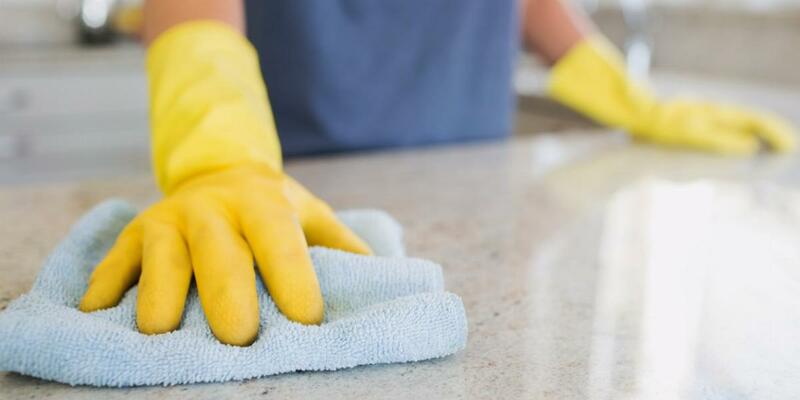 □ Take everything off the countertops and clean them with disinfectant spray or wipes. □ Wash any windows and window sills and vacuum out the tracks. □ Was the microwave plate in the dishwasher and deep-clean the inside. □ Empty the pantry and check for any items past their prime. □ Wipe down cabinet faces, pantry doors and the fridge and freezer. □ Empty the refrigerator, toss expired items and wipe down shelves and drawers. □ Throw your cloth kitchen mats or rugs in the washing machine. □ Vacuum and sweep the floors. □ Run a "clean" cycle on the oven, let it cool completely and wipe it out. Pro Tip: Depending on the size of your kitchen, this project can take some time. Break it into smaller, more manageable sections. Spend one day going through the cabinets, another on the pantry, and one day for the fridge and freezer. Even though bathrooms are usually smaller than other rooms in your home, they need to be cleaned more often since clutter and grime build up in such a short amount of time. Before you start scrubbing away at soap scum, it’s important to go through the bathroom and get rid of any junk that’s laying around. Empty out the cabinets, shelves and drawers, grouping similar items as you go. Decide what you need to keep and get rid of the rest. Keeping the bathroom clutter-free is half the battle when it comes to cleaning. □ Move any decorations on the walls and countertops to another room while you clean. □ Wash the shower curtain and rugs. □ Empty bathroom cabinets and throw out any expired or damaged items. □ Dust light fixtures and vents. □ Dilute a few drops of dish detergent in a bucket of water and carefully wipe down the walls. You can also substitute distilled white vinegar for the soap. □ Wipe down drawers and dust shelves, working from top to bottom. □ Snake the shower drain to remove any built-up residue. □ Deep-clean the shower and tub using disinfectant and bleach. □ Snake the sink drain(s) if they’re draining slowly. □ Use disinfectant spray to clean sinks. □ Use window cleaner to get spotless mirrors, sink hardware and windows. □ Wipe down the exterior of the toilet and clean the inside of the bowl. □ Wash baseboards using a microfiber cloth. □ Sweep or vacuum floors before washing with a cleaning solution. □ Reorganize products stored under the sink. It’s the room you spend the most time in, whether you’re relaxing after a long day at the office or entertaining family and friends. With all that foot traffic, your living room could probably use a little TLC. Start from one corner and move systematically across the room, collecting things that don’t belong and either donating or tossing them. "The sticky notes can be used to label boxes of items to recycle, sell, donate, shred or move to other rooms. It is also helpful to have a notepad or a smart phone to write down any follow-up tasks you need to do after spring cleaning, such as returning a library book or giving a borrowed item back to a friend." Need help finding a reason to let something go? Haworth recommends getting rid of “anything that no longer serves a purpose in your life.” In the living room, that’s most likely a shelf with books, DVDs, video games or board games that you won’t read, watch or play again. Once your sorting is complete, it’s time to deep clean what’s left with these spring cleaning tips. □ Clear off any surfaces and check for random things under the couches and chairs. □ Dust book cases, television stands, video game consoles, coffee and end tables. □ Use furniture polish to wipe down the tops of tables and consoles. □ Wash windows and window sills and vacuum out the window tracks. □ Wash curtains, drapes, blankets and throw pillows with removable covers. □ Disinfect any children’s toys with either soap-and-water or kid-safe wipes. □ Deep clean the floors, sweep and wash hardwoods and vacuum all carpeting. *Most of the time you can follow instructions on the cushions, but you can always resort to the vacuum and use a dry sponge to remove dirt and oil. For leather couches, there are special cleaners and soft sponges to remove surface dirt. Offices can act as a catch-all room for papers and projects that don’t have a home anywhere else. Sara Pederson from Time to Organize explains that about “80 percent of what we file is never looked at again. Keep only the papers you truly need.” Spring cleaning your office creates a productive atmosphere so you can pay bills or finish a project for work without distractions. □ Go through file cabinets and drawers to toss anything you no longer need. □ Create action files for anything you can’t take care of right away. □ Clearly label any files or storage bins that are missing them. □ Shred any sensitive documents that you don’t need to keep. □ Use pressurized air to clean computers, keyboards, monitors and other appliances like paper shredders. □ Remove all items from bookcases and shelving units to dust and wipe down the surfaces. □ Dust around and underneath computers, printers and other stationary electronics. □ Wipe down the office furniture using furniture or wood-safe polish. □ Clean windows, dust sills and vacuum out the tracks. □ Vacuum carpets and/or sweep the floors. □ Empty your wastebasket and paper shredder. The bedroom should be your personal retreat where you unwind from the day before going to sleep. But if your nightstand is an extension of the office, and your closet is loaded with overflow from the mudroom, some rearranging is in order. As you begin cleaning out your bedroom, clear out the drawers in your dresser, nightstands or bedside tables. Start small, since going through all of your personal items can be overwhelming to tackle all at once. "I say to take one drawer out at a time. Don’t over commit yourself to the whole dresser if you only have an hour. 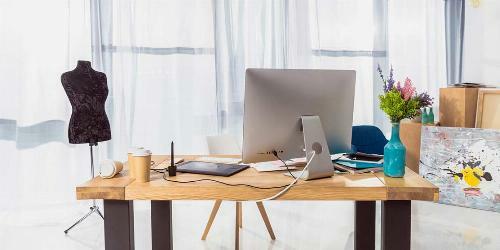 Set realistic expectations for the space." Have a donation box, trash bag, sticky notes and marker on hand as you go through your bedroom. You may find items that you borrowed from a friend, shirts that are stained and jeans that no longer fit. Part of keeping the bedroom clean and organized is to only keep items that serve a purpose. □ Start a load of laundry for bed sheets, pillowcases, blankets and curtains. □ Dust light fixtures and ceiling fans. □ Remove any hanging decorations and picture frames to be dusted and wiped down. □ Run a lint brush over lamp shades. □ Wipe down and clean windows and window sills. □ Polish or treat wood furniture. □ Vacuum or sweep the floor. □ Clean the mattress using the upholstery attachment on your vacuum. 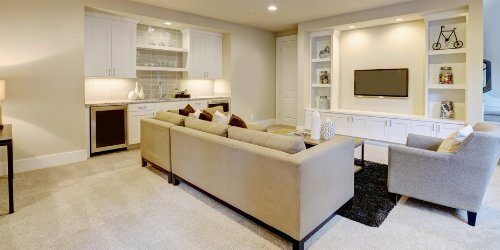 □ Move furniture towards the center of the room and wipe down baseboards and trim. Pro Tip: A good rule of thumb when it comes to decluttering and cleaning your bedroom is to keep flat surfaces like your nightstand clear. It’s perfectly fine to have a few pictures or decorations and a lamp, but keep it to a minimum. We all want an organized closet, but we often forget about the disorganization and clutter once the doors are closed. This is the perfect time to make this space work for you. □ Carefully wipe down any ceiling lights. □ Clear off shelves and drawers. □ Wipe everything down with a duster. □ Use a general cleaner to clean closet doors and knobs. □ Sweep or vacuum the floor. Once the closet has been cleaned, organize your clothes, shoes and accessories as you put them back in the closet. Hanging items should be grouped by type, and Coufal also suggests organizing them by color from white to black. Pro Tip: If you have multiples of something and you use all of them frequently – invest in a specific storage solution for them. Belts or hats are a good example. Most home improvement stores have hangars or clever drawer organizers for these accessories that keep them from being left on the floor or lost behind other clothing. Take your time. Breathe. Rome wasn’t built in a day, and that applies to your checklist. Spend time in each room to make sure you’ve gone through everything, “re-homed” items and scrubbed away any dirt and grime. Looking for more advice to declutter your home? Read our series How to Organize Your Home Room-by-Room for helpful tips from the pros. If your home office has turned into a dumping ground for assorted papers and clutter, it’s time to get organized.